By Paldeep Atwal, M.B., Ch.B. It’s been over a decade since the human genome was first sequenced. In that time, we have seen a great deal of progress take place as we head toward genomic medicine. But what does it actually look like, and what still needs to happen to get us there? After the first human genome was sequenced in 2003 there was a great deal of anticipation and excitement. The vision was of a new era of “Genomic Medicine” where the complexities of a patient’s DNA would be used seamlessly and integrated with current medical treatment. However, there were no immediate or tangible benefits apparent, and while the media storm died down, genetic research increased exponentially. Fast forward to today and there is a lot of talk of genomic medicine and the new field of precision/individualized/personalized/stratified medicine has emerged, promising better clinical decisions through improved individualized approaches. Some of the benefits include better targeted therapies such as molecular targets in cancer, reduced side-effects of drugs with the help of pharmacogenomics testing, increased prevention of prediction of disease using a molecular approach, reduced healthcare costs and improved overall patient care outcomes. Indeed genetics and genomics is reaching an inflection point in terms of cost, volumes and knowledge. The numbers are impressive, cost of sequencing is now below $1,000, number of sequences performed to date reaches into seven figures and validated single-base variants in the human genome continues to increase with ever expanding genetic knowledge. Genetics and genomics is firmly within the public spotlight, from direct-to-consumer testing, including carrier testing for reproductive risk, genetics of common diseases such as heart disease and obesity, “clues” for conditions such as Alzheimer’s and cancer, all the way to how genetics effects human longevity. A common analogy used in genomic medicine is that we are moving from the anatomical microscope, used for centuries in traditional anatomical medicine practices, to the genomic stethoscope. While sounding impressive, the challenges faced with making this transition are considerable. The Mayo Clinic Center of Individualized Medicine (CIM) a is the culmination of the needs and desire of one of the oldest and best known names in health care to lead the effort to rapidly translate advances in genetics and genomics into advances in patient care. There are significant barriers which continue to hinder assimilation into mainstream medical practice. Examples include access to and standardization of technology, education, reimbursement, regulation, evidence-based clinical validity, and evolving ethical dilemmas. CIM is a “transformational” center with clinical, research and education responsibilities and its goal is to promote rapid translation of research into personalized clinical care and to create genomic medicine mechanisms that are instantly diffusible and applicable across Mayo Clinic's multiple, geographically dispersed campuses. One of the main initiatives to accomplish CIM’s goals was the creation of the Individualized Medicine (IM) Clinic. One unique feature is that, in contrast to traditional academic medical center models, the IM clinic is not housed within any one established department. A working group was created for the clinic, which includes clinicians across the institution's departments to contribute expertise. Unaffiliated, the IM Clinic processes were created de novo and designed for the ideal patient encounter, transcending the limits of a single medical, surgical or pathology specialty. Translation programs were implemented. These include specialty areas of microbiome, epigenomics, pharmacogenomics, biomarker discovery and clinomics (clinical application of “omic” platforms). To support these translation programs, infrastructure support programs such as institutional biobanking, genome sequencing, and bioinformatics infrastructure, along with a subset of information technology and bioethics resources, were aligned under CIM to facilitate infrastructure coordination and prioritization. As an example, the Mayo Clinic biobank has over 50,000 patient samples, a number which is increasing daily. Patient samples have DNA banked and linked extensive electronic medical records which on average contain 14 years of health information. Plans are being actively discussed to perform whole genome sequencing, metabolomic profiling and other “omic” platform analysis and make this de-identified information available to researchers with the hope and promise to improve health care across specialties. Genomic influences on cancer are well established and molecular characterization of tumors has been shown to be beneficial to patient care and is rapidly becoming the standard in treatment of somatic cancer. For this reason the first “service line” created was for patients with advanced cancer who have failed standard therapy (or where no proven standard therapy exists). The IM clinic uses next-generation sequencing for comparison of normal and tumor DNA to identify causative or contributing mutations and, subsequently, allows targeted therapy based on genomic information. The second service line created was for patients labelled a “diagnostic odyssey.” These are patients with a suspected genetic condition for whom previous testing did not reveal a causal etiology. Often they have had a litany of prior testing and have been searching for a unifying diagnosis for years, and sometimes even decades. Clinical whole exome sequencing (WES) is primarily employed to reveal the variant(s) responsible for the patient's disease and proposes potential treatments, although other, more traditional, genetic testing such as gene-panels, chromosomal microarray and biochemical genetic analysis are also employed. Additionally, more novel clinical strategies such as global metabolomic profiling have been shown to help get a successful diagnosis for patients. 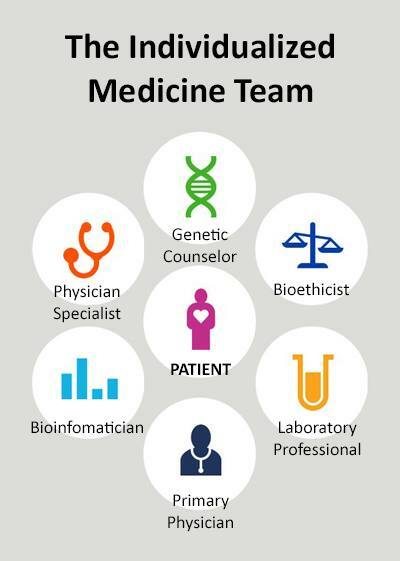 The third service line is called “predictive genomics” This was created due to the increasing demand of patients who wanted education about their genomic data and potential influences it may have on their health, even with no apparent disease or traditional “clinical question” to address. Patients will meet with the clinical team and discuss options from a simple family history, often called the first genetic test, to whole genome sequencing. So called “intermediate” options include pharmacogenomics profiling to inform prescribing and testing of “medically-actionable” genes, such as the ACMG 56-gene panel. Predictive testing is typically not covered by medical insurance at this time so patients pay out-of-pocket for this testing. The information received from testing is given to the patient and also, where possible used to improve their care plan. For example, once patients undergo pharmacogenomics testing this information is implemented into their electronic medical record in the form of “drug-gene” interactions. To date, over 3,300 alerts have fired and over 3,000 positive findings have been added to electronic medical records. These drug-gene interaction include poor response to medications such as clopidogrel which may be important in the common health care scenario of coronary stenting after a heart attack. Indeed this prescribing guidance on clopidogrel is recognized and advised by the FDA, yet is still not routinely performed in clinical practice. We hope that through predictive testing and implementation of the data into the medical records, patients will enjoy lower health care costs and better quality health care through potential lower diagnostic complexity and appropriate prescribing of medication. While each service line requires a slightly different work flow and professional skills, a common infrastructure was built to accommodate the basic IM Clinic function. Representatives from IT, bioinformatics, bioethics, patient access management, education, revenue cycle, operations and the research sequencing facilities joined the IM Clinic Work Group to design the structures and processes implemented across all Mayo Clinic campuses. Each patient is given a lead physician who coordinates their care, and this physician acts as their IM clinic consultant. The lead physician depends on the primary reason for referral to the IM clinic. For example in advanced cancer, it is often a medical oncologist or hematologist, and in diagnostic odyssey it is typically a clinical geneticist, although any specialist such as cardiology, rheumatology and so on can be the lead consultant. 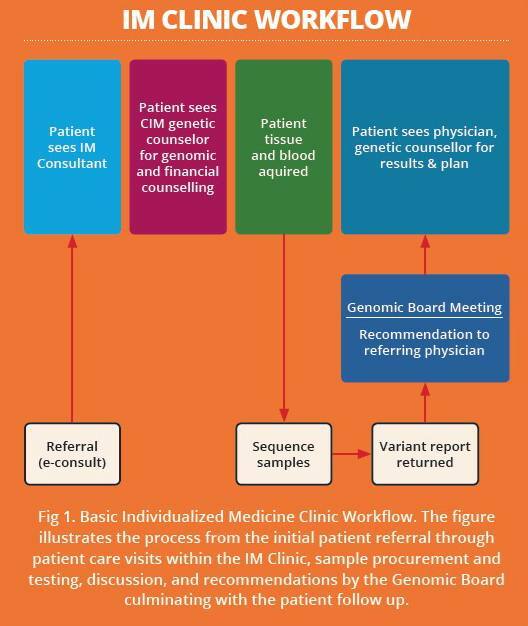 A key component of the IM clinic and one that helps facilitate the patient journey is the genetic counsellor. Genomic medicine is a complex discipline. Vocabulary alone can overwhelm patients. However, they must be informed about the potential risks and ramifications created by genomic data and genetic testing. So the role of the genetic counsellor is critical. A consultation with the IM clinic typically will start with a genetic counsellor who takes a detailed history which includes the construction of a family pedigree and assessment of risk based, inheritance patterns and possible disease origins. Dedicated time is necessary for face-to face visits between CIM genetic counsellors and the patient (and often family members). Genetic counsellors define and explain vocabulary and concepts; talk explicitly about different lab tests and their potential results and risks; and apply a shared decision-making model to help the patient select the categories of genomic results to be returned. The genetic counsellor consults with the lead physician and together a treatment plan is discussed with the patient. Given the vast and highly complex nature of genetic testing a post-test expert review board is required for each service line. For advanced cancer, the “Genomic Tumor Board” meets to discuss individual cases and gathers a consensus opinion on interpretation of results and modification in medical management. Similarly, for diagnostic odyssey cases, the “Genomic Odyssey Board” acts as the clinical interpretation team. These expert boards are multidisciplinary and encourage wide participation and exchange of experience, drawing genomic medicine experts from across the institution, including standing members from Anatomic Pathology, Molecular Genetics, Clinical Genome Sequencing Laboratory, Clinical Genetics, Hematopathology, Medical Genome Facility (research), Bioinformatics and Biomedical Ethics. There have been many lessons learned since the IM clinic opened about two years ago. First, patients are coming to us with some genetic knowledge, and with a high-risk tolerance when it comes to genomic findings. However, even well-educated patients require thoughtful conversations with genetic counsellors and genome-educated clinicians. We have also learned that patients want materials ahead of time and materials to take home with them. Electronic education opportunities need to be further explored. Another major issue in conducting genetic testing is that of insurance coverage. Billing codes for genomic lab services need to be established and recognized by payers such as insurance companies and Medicare/Medicaid. It is often difficult to anticipate what out-of-pocket expenses patients might incur and what revenue impact it may have on CIM. For patients with advanced cancer we are able to find a sequencing-based druggable target around 50 percent of the time. It is important to note this does not translate to finding a cure and also does not mean the patient will always be able to get additional therapy as clinical context, drug availability and control issues need to be addressed. For patients on a diagnostic odyssey around 30 percent of the time we are able to find a definitive diagnosis. The question is often posed, why is it not 100 percent? The reasons are complex, for example the current clinical standard is whole exome sequencing. It is widely regarded that around 85 percent of disease causing variants are found within the exome. Of course, this leaves open the path for clinical whole genome sequencing to find other causal variants not present in the exome. The sequencing itself however is also not complete, with difficult to sequence regions, pseudo-genes, copy number variations such as deletions/duplications and triplet repeat disorders which are not reliably tested for on whole exome sequencing, partly due to current short-read length technologies employed in next generation sequencing. Exome sequencing is improving, however, and newer methods such as read-depth analysis and longer-read lengths are improving sensitivity for, for example, copy number variations, although in the clinical context it does not surpass the gold-standard of more traditional approaches, such as exon-level microarray analysis. Furthermore, there are other causes of diseases not captured with clinical exome sequencing; post-genome modifications such as alternative gene splices transcripts/isoforms, post-transcriptional modifications, gene fusions (e.g. BCR-ABL) and pathogenic variants which change gene expression are simply not detected on genome sequencing and “Whole transcriptome sequencing” or RNA sequencing. RNA sequencing is tissue specific, dynamic and has the potential to “inform” genomic data such as analysis of expression levels of genomic variants in cancer. Other “genomic considerations” include long-range genome effects such as locus control regions far upstream of gene of effect, cis/trans acting elements, the genetic handicap principle which states that deleterious variants can be “tolerated” if the overall deleterious variant load is low, and lastly, multi-genic or gene-gene interactions. Clinical testing of these areas is still very much in the early stages and it is exciting to think of what discoveries and advances will be made in the next one, five and 10 years. Given the rapid pace of advancement it is also impossible to predict or know what is next, particularly with the advancement of gene-editing technologies such as CRISPR/CAS9. Clinical whole exome-sequencing will remain the mainstay of testing in the IM clinic for the time-being. It will evolve as genetic knowledge and analytics improve. New platforms and technologies will translate into clinical practice out of the research realm, and we will use many –omics platforms concurrently to aid and augment the genetic data. As with anything in health care all these exciting developments will need to get round the very real challenges of cost, insurance coverage, turn-around-time, education and desire from health care institutions. — Paldeep Atwal, M.B., Ch.B., medical director and attending physician, Center for Individualized Medicine, Mayo Clinic, Florida. 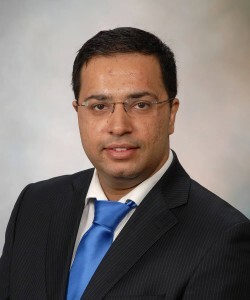 Dr. Atwal’s clinical interests include clinical genomics, undiagnosed diseases following lengthy diagnostic odysseys and inborn errors of metabolism including mitochondrial diseases. He grew up in Glasgow Scotland, and in his spare time enjoys researching the health benefits of single malt Scottish whisky! This article originally appeared in the December 2015 issue of Frontline Genomics. It is reprinted with permission. Lazaridis KN, McAllister TM, Babovic-Vuksanovic D, Beck SA, Borad MJ, Bryce AH, Chanan- Khan AA, Ferber MJ, Fonseca R, Johnson KJ, Klee EW, Lindor NM, McCormick JB, McWilliams RR, Parker AS, Riegert-Johnson DL, Rohrer Vitek CR, Schahl KA, Schultz C, Stewart K, Then GC, Wieben ED, Farrugia G. 2014. 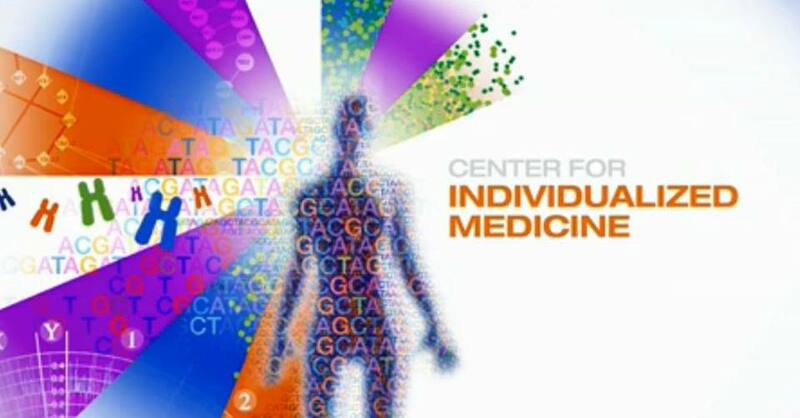 Implementing individualized medicine into the medical practice. Am J Med Genet Part C Semin Med Genet 166C:15–23. Chan IS, Ginsburg GS. 2011. Personalized medicine: Progress and promise. Annu Rev Genomics Hum Genet 12:217–244. Stratton MR, Campbell PJ, Futreal AP. 2009. 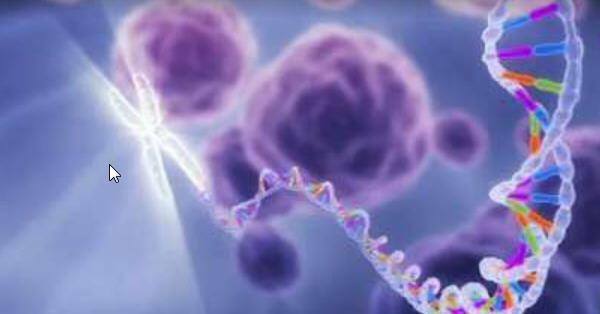 The cancer genome. Nature 458:719–724. Green ED, Guyer MS, National Human Genome Research I. 2011. Charting a course for genomic medicine from base pairs to bedside. Nature 470:204–213. Dietz HC. 2010. New therapeutic approaches to Mendelian disorders. N Engl J Med 363:852–863. Guttmacher AE, Porteous ME, McInerney JD. 2007. Educating health-care professionals about genetics and genomics. Nat Rev Genet 8:151–157.